The blackberries available in LA were not as sweet as those in SF these days, so this tart was a bit more, well, tart, than expected. However, those of us who don't eat a lot of refined carbs really enjoyed it. Giao's grandma, however, recoiled at first bite. With your fingers, incorporate the cold butter into the flour until the mixture resembles course corn meal. Then form into a ball, adding 1 tb water at a time until you can do so. Press the dough into a pie pan and bake for 10 minutes on 350. Then add the blackberries and bake for about and hour, until berries are bubbly and crust is golden. Same recipe as above, but substitute 1 diced pear and 1.5 cups blueberries. The above fish, rolled up with lettuce in a rice paper wrapping. These were a little sweeter than ours, but were still very tasty. Wow. These were awesome. This little, hard boiled quail eggs were encased in shrimp paste, then rolled in panko, then deep fried. They were so good. Pictured above and below. This was quite good, although oddly not spicy. We got into LAX and immediately went to our reservation at Shin Sen Gumi Yakitori. This place had been recommended by a co-worker of Giao and we wanted to try it out. The second we walked in we were greeted en masse by the staff, in Japanese, which much fanfare, a greeting that continued throughout the night, as more people arrived. The service was a bit slow and our dishes arrived haphazardly, but most of it was really tasty. It ended up being about $150 total, for 4 people, including 2 bottles of sake. Each individual stick was between about $1 and $4. These were all good enough to order twice. This was probably our favorite morsel of the night. The shiso and basil added a nice herby quality that offset the fatty pork belly. Yum. I think we generally liked anything wrapped in pork belly. We ordered this after we had thought we were done because we saw it at the table next to us and it just looked so good. It was. The meat was tender and juicy, the coating was crisp and the lemon was a really nice, simple accompaniment. A bit sweet, but very good. These were the smallest gyoza we'd ever seen, but they were light and flavorful. These really just tasted like hot dogs. We were not very impressed. Giao's a sucker for trying any offal he sees, since it's a rare treat. Nice and light in texture. We are pretty sure they used real wasabi which really made this stick a treat. The non-deluxe version of the sausage. Again underwhelming. The liver taste was pretty strong even for Giao. Alexis and Giao's Mom really enjoyed the eggs. Really fun and tasty, but it's possible to OD on the fattiness. The triangle shape maximizes the most sought after fried bits. The pickles offered a great complement. We weren't aware that chicken had tails before, but Alexis couldn't deal with the crunchiness of the cartilage. Giao as usual, ate it up, but agreed that the texture was a bit distracting. We had a bunch of leftovers, so Alexis added some sliced chicken sausage to the caramelized onions and peppers (from the super bowl) and some spinach she had previously frozen lest it go bad and we had a nice, healthy dinner, with leftovers for lunch the next day. 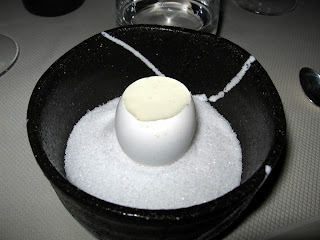 Alinea was, by far, our best eating experience of the year. The food was delicious. It was innovative without being gimicky (for the most part). The service was friendly, yet distant; just the way we like it. The decor was stunning, if understated. It was totally worth the 24 hour trip to Chicago. And the price for 24 courses was about the same as for 5 courses in Vegas. All we can say is wow, and if you are ever in Chicago, make a reservation. Our favorite new restaurant that opened this year was Spruce. 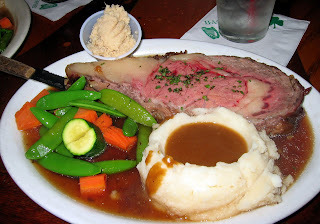 It is the San Francisco outpost of The Village Pub in Woodside and we were quite impressed. We ate there in the first month and it seemed as if they had already worked out all the kinks. The service was great. The decor was warm yet sophisticated. The food was tasty and the portions were large, which was certainly refreshing. We can't wait to go back. You can usually find at least a few good items to gorge ourselves on at a buffet, but the Thanksgiving buffet at the Wynn Las Vegas had the largest variety of tasty foods this year. We ate so much that we had to retire to our room and lay flat out on our backs with our pants unbuttoned. We have to tip our hat to Palace BBQ. Although Wynn won for the variety, Palace is definitely the most interactive and the most low-carb friendly of buffets. We love cooking an endless supply of meat and seafood on our own grills in the center of our table. Honestly, we don't even remember what the bathroom at Bushi-Tei looked like. What we do remember is the Japanese toilet. At Bushi-Tei you can spray your nether-regions with warm water, then dry them with a steady stream of warm air all with a touch of a button. It's an experience that is strange and wonderful, all at the same time. In terms of food, Mix was an expensive disappointment. But we would suggest going there for a drink just to gaze at the decor. The entire two story interior is white, but in many textures and shapes. It is futuristic and soft at the same time and the views of the Las Vegas strip can't be beat. The decor at Alinea was futuristic and, yet, somehow, warm. When you walk into the door of the all-black building, you immediately walk down a hallway that gets smaller the farther you go, until you finally reach a door that opens (Star Trek style) into the restaurant. Town hall has great, very large, semi-rustic chandeliers that are a pleasure to look at. Wow. This dessert was so great we are still talking about it. This is the only dessert Alexis has ever seen Giao finish, ever. 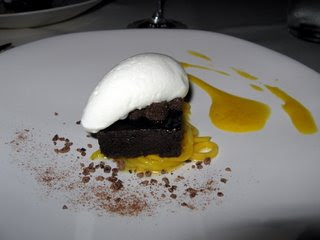 It was not very sweet, had a touch of sour and was everything you could want in a dessert if you are not a sweets person. Coi hit the mark again with this amazing dish. It was soft and eggy and the foam was pure essence of parmasean. The presentation was also wonderful. These brains were so smooth, so pudding-like, you really couldn't tell you were eating brains. We had heard of the infamous bacon dog...and finally we happened upon it. 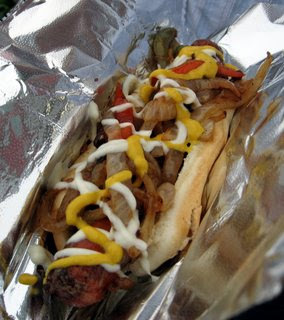 It was tasty and bad for you and really, mayo in a hot dog is a revelation. This Quebecois treat was taken up a notch by the people of Salt House. 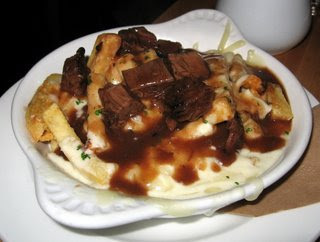 The gravy was rich, filled with succulent short rib bits and was not starchy at all. Who would have thought that someone could make the combo of fries, cheese and gravy even better? Ever since Philly-native Giao found a decent Philly-style Cheesesteak near his work at Manhattan Hub, he's gone at least once a week. His only complaint is that the amount of meat they use is inconsistent and much too small for a real Philly steak. He usually has to order 2 of them, making this nostalgic lunch an expensive one. Alexis loves Mixt Greens, also close to work, but not on her own dime. Their "make-your-own" salad has tons of options and the grilled filet mignon is an excellent addition to a salad of organic greens. While writing value and Thomas Kellar in the same sentence seems strange, we defy you to feel any stirrings of buyer's remorse on this prix fixe where you can (and will) go back for seconds at no extra cost. In another nod to Thomas Keller, the service at Per Se was out of this world. Service at Keller's restaurants is exemplified by their invisible attentiveness. At one point, Giao had eaten a single bit of brioche with his foie gras when it was replaced with another dish of piping hot brioche toast...and he didn't even notice until he didn't see a bit mark in his toast. These noodles were presented as paste in a tube. When we squeezed the tube into the hot broth the paste became slurpable noodles. Yummy and fun. This cheese is both decadent and humble. 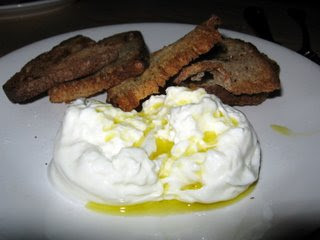 The cheese is packed in cream, then drizzled with olive oil and sea salt. We eat it with a fork and throw away the toast. Giao even orders it for dessert. 1) The waitress, Loriann (who always is on top of it and finds us a table even when it is packed). 2) The cheap and tasty wings. It is a great financial district pub that's perfect for an afterwork drink or a football game. Tekka is the only place we have ever eaten that banned us from taking pictures because the sushi chef "doesn't like the internet". We can respect that because the down-home Japanese omakase was one of the best we've ever has, and cheap to boot. House-cured charcuterie has been all the rage this year and our favorite was at Spruce. 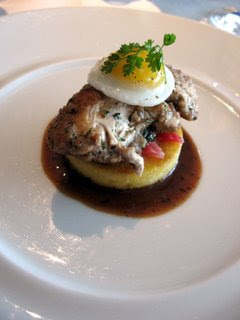 We especially loved the foie-gras mousse with port reduction. This is a super easy, very quick weeknight meal, especially if you remember to thaw the fish beforehand. Mix the mustard and the vinegar and pour over the salmon. Bake the salmon on 375 until just done, about 15 minutes. When the fish flakes with a fork, it's ready. 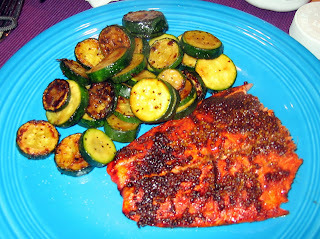 The zuchinni was simply sliced, seasoned with pepper and salt and sauteed over medium heat until browned. We went to Fresca for our friend, J. 's, birthday. Fresca is a mid-range Peruvian place with a few outposts around the city. Honestly, the food was a bit of a disappointment. Rather bland, but warm, and that means a lot. These sounded better than they were. They were too sweet and too breaded. This was by far the highlight of the meal. The ceviches were very different from each other and all were delicious. The one made with squid ink was particularly tasty. Pictures above and below. The chops were pretty good, but the shrimp were overcooked. This dish was fine, but not special. The pomegranate added a nice touch, but I don't think we finished this dish between the 5 of us, so that's saying something. These were so bad we sent them back, and they were removed from the bill. They were old and small. This was really terrible paella. It was flavorless until we added hot sauce, at which point the spice was all we could taste. And the mussels were sub-par. The fish was very overcooked, but the risotto cake drenched in sauce was pretty tasty.